Ketorolac is a potent non-steroidal analgesic drug. It is 36 times more potent than phenyl butazone, and twice as that of indomethacin. The oral administration of ketorolac is associated with high risk of adverse effects such as irritation, ulceration, bleeding of gastrointestinal tract, edema as well as peptic ulceration. These attributes make ketorolac a good candidate for controlled release dosage forms, so as to ensure slow release of the drug in the stomach. The present study reports on the formulation of ketorolac loaded Eudragit RS100, Eudragit RL100 as well as Ethyl cellulose as a controlled release drug delivery system. Solid dispersion and microencapsulation by air suspension method were the techniques of choice in order to coat the drug so as to improve bioavailability and stability and also target a drug at specific sites. The ratio of (1:3) drug to polymer from all polymers used was selected from solid dispersions systems as well as microcapsules to conduct further in vivo evaluation, since it was the best ratio which achieved significant reduction in the release of ketorolac at acidic pH of the stomach and maximal release at alkaline pH of the intestine. The effects of various formulations on ulcer index as well as ulcer incidence were studied. The obtained results indicate that microencapsulation technique was able to protect the stomach from ulcerogenic effect ketorolac compared to solid dispersion technique. Ketorolac tromethamine, Solid dispersion, Microencapsulation, Controlled released systems, Ulcerogenic activity of ketorolac in rats. Non-steroidal anti-inflammatory drugs (NSAIDs) are among the most commonly used drugs worldwide and their analgesic, anti-inflammatory and anti-pyretic therapeutic properties are thoroughly accepted. More than 30 million people use NSAIDs every day, and they account for 60% of the US over-the-counter analgesic market. Like many other drugs, however, NSAIDs are associated with a broad spectrum of side effects, including gastrointestinal (GI) and cardiovascular (CV) events, renal toxicity, increased blood pressure, and deterioration of congestive heart failure among others. In this review, we will focus on upper and lower GI tract injury . The damage of gastric and duodenal mucosa caused by NSAIDs has been widely studied. These upper GI side effects include troublesome symptoms with or without mucosal injury, asymptomatic mucosal lesions, and serious complications, even death [2,3]. Ketorolac is a potent non-steroidal analgesic drug, frequently used for treatment of rheumatoid arthritis, osteoarthritis, a variety of other acute and chronic musculoskeletal disorders and mild to moderate pain [4-6]. Ketorolac is used clinically for the management of post-operative and cancer pain. Previous studies have suggested that ketorolac's analgesic efficacy may be greater than other non-steroidal anti-inflammatory drug sand comparable with that of morphine in models of acute pain [7-11]. Regardless of the route of administration, the biological half-life of the drug ranges from 4 to 6 h in human , its oral bioavailability is estimated to be 80%. The oral administration of ketorolac is associated with high risk of adverse effect such as irritation, ulceration, bleeding of gastrointestinal tract; edema as well as peptic ulceration . These attributes make ketorolac a good candidate for controlled release dosage form, so as to ensure slow release of the drug eliminating the disturbance of the gastrointestinal tract. A well designed controlled drug delivery system can overcome some of the problems of conventional therapy and enhance the therapeutic efficacy of a given drug. To obtain maximum therapeutic efficacy, it becomes necessary to deliver the agent to the target tissue in the optimal amount in the right period of time there by causing little toxicity and minimal side effects. There are various approaches in delivery a therapeutic substance to the target site in a sustained controlled release fashion. Considerable evidences exist in the literature to demonstrate the effect of formulation on the efficacy of orally administered pharmaceuticals [14-16]. Acrylic resin and celluloses have been used to encapsulate drug particles and also to obtain microcapsules and solid dispersions with different physicochemical properties and to alleviate certain side effects of the parent drug [17-21]. The aim of this work in this study was to investigate how gastric lesions induced in rats by ketorolac were influenced by the pharmaceutical properties of the drug. Both solid dispersion preparations and microcapsules having different pharmaceutical properties and pure drug were orally administered to fasten rats and the relationship between pharmaceutical properties of each preparation and the induction of gastric lesions were clarified. Ketorolac tromethamine (Sigma-Aldrich, St. Louis, Mo, USA) was a gift sample kindly supplied by Amriya pharmaceuticals industries, Alexandria, Egypt, Eudragit RL100 and Eudragit RS 100 were purchased from RÖhm Pharma GMBH, Darmstadt (Germany), Ethyl cellulose was obtained from Sigma-Aldrich Chemi (Germany). All other reagents and chemicals were of analytical grades and were used as received. Three types of solid dispersion of ketorolac with Eudragit RS100, Eudragit RL100 and Ethyl cellulose were prepared. The method was achieved by dissolving 1500 mg of the polymer in a mixture of ethanol: dichloro methane in a ratio of (1:1) in a glass vessel at 40°C ± 0.50 using Vortex Mixer (Maxi mix 11, Thermolyne Corporation, U.S.A.). The mixture was stirred at 400 rpm in a water bath (KOWELL N4, Germany) over 20 min. The mixture of ethanol: dichloro methane in a ratio of (1:1) was used as a solvent for the used polymers. 500 mg of drug was gradually added to the above mixture with stirring until completely dissolved. The rotation speed of the magnetic stirrer was continued until the solvent mixture was removed by evaporation. The dry film obtained was pulverized and passed through No 450 μm sieve in order to obtain a homogenous particle size [22-24]. The obtained product was kept in a desiccator over silica gel under reduced pressure until used. Coating solutions with concentration of 5% w/v Eudragit RS100, Eudragit RL100 or Ethyl cellulose in acetone-isopropyl alcohol mixture (1:1) were prepared by dissolving 30 gm of each Eudragit RS100, Eudragit RL 100 or Ethyl cellulose separately in 200 ml solvent mixture [25,26]. Reviewing the literature about air suspension technique revealed that microencapsulation by this technique reduces processing time and improves the product properties. It was also proven to be more convenient method especially in case of thermo-labile materials. The process consists simply of supporting 30 gm drug in the vertical container simply fluidized from below by a stream of air. The exhaust filter was shaken from time to time to keep the entire drug inside the container. After adjusting the atomized compressed air, the solution of 5% w/v of either Eudragit or Ethyl cellulose in acetone-isopropyl alcohol mixture (1:1) was sprayed over the bed. The spraying pump was adjusted to be 10 rpm to give a suitable droplet size from the sprayed solution. The temperature was maintained at 35-40°C during the coating process. The volume of the solution needed to produce the desirable microcapsules was 200 ml. When the microcapsules have been formed, the spray was turned off and the product was left to fluidize inside the apparatus for about 60 minutes for complete drying at the same temperature. The encapsulated particles were stored in a desiccator over anhydrous calcium chloride for 48 hrs before any further study. Table 1 shows the operating condition in coating ketorolac powder. The ratio of (1:3) drug to polymer from all polymers used was selected from solid dispersions systems as well as microcapsules to conduct further in vivo evaluation, since it was the best ratio which achieved significant reduction in the release of ketorolac at acidic pH of the stomach and maximal release at alkaline pH of the intestine . Male Wister rats, weighing 180-200 gm, were obtained from National researches center (Cairo, Egypt). Rats were maintained at 22 ± 1°C on a 12 h light-dark cycle allowed rat chow and water ad libitum. Five groups of rats (n=6 animals per group) were used. The allocation of animals to all groups was randomized. In-vivo experimental protocols had the approval of the institutional animal ethics committee (IAEC) (IAEC/PROPOSAL/DB-4/2010). Before the start of the experiments, rats were housed individually in wire mesh cages to avoid coprophagy under controlled environmental conditions. Food was withdrawn for 36 h  but water was allowed ad libitum. The absence of ulcers in some of the treated groups has revealed that the pre-fasting conditions alone doesn't induce ulcer. Table 2 shows the experimental design and animal groups. As described in the studies [29-31], on the morning of the experiments each fasted rat was orally administered 1.0 ml suspension of the assigned drug by oral gavage in a dose equivalent to 5 mg per kg of ketorolac  or different ketorolac controlled release systems. Magnetic stirring was utilized to obtain a well-dispersed suspension of each drug and controlled release systems. Six hours later, each animal was removed, anaesthetized with ether, and the abdomen was opened. Each stomach was excised, dissected along the greater curvature and contents were emptied by gently rinsing with saline solution. Each stomach was pinned out on a flat surface with the mucosal surface uppermost . The ulcer incidence was represented as hemorrhagic lesions and gastric ulcers were examined and assessed macroscopically with the help of a 10x binocular magnifier immediately after the animals were sacrificed. To quantify the induced ulcers in each stomach, the scoring systems described in the literature  was employed. The induced ulcers in these experiments were in the form of small spots punctiform lesions and thus each was given a score between 1 and 4. Ulcers of 0.5 mm diameter were given a score of 1 whereas ulcers of diameters 1 and 2 mm were given scores of 2 and 4, respectively. Stomach with no pathology was assigned a score of zero. For each stomach, an ulcer index was calculated as the sum of the total score of ulcers. Six determinations were made for each drug suspension administered. The average ulcer index is presented as the mean (n=6) ± standard error. For histological examination, the stomach was surgically extirpated from each group and opened through vertical incision along the greater curvature and photographs were taken of the inside surface of the stomach. The stomach tissues were then washed in saline solution and a portion of it was kept in 10% buffered formalin for histopathological studies. The sections were then stained with hematoxylin and eosin. The tissue sections were examined under an Olympus BX51 (Olympus Corporation, Tokyo, Japan) microscope and images were captured with a digital camera attached to it. A summary of gastric ulcer data for this experiment is shown in Table 3. Only gastric glandular ulcers were observed. • Rats were treated as previously described in the experimental design. • All data for number of ulcers per rat is presented as Mean ± S.E. (n=6). From Table 3 it is obvious that, rats of Group I (control group) which were administered distilled water shows zero ulcer incidence as, no one develops ulcer from the total rats of this group (all stomachs are of normal type). For Group II, in which six rats were administered 5 mg/kg of ketorolac, all the rats show ulcer in their stomachs with ulcer incidence of 100%, an average ulcers number per rat of 10 and an average cumulative ulcer length per rat of 36.14 mm. For Group III, in which six rats were administered ketorolac solid dispersion of ketorolac-Eudragit RS 100 only one rat shows ulcer with ulcer incidence of 16.66, an average ulcers number per rat of 0.33 mm and an average cumulative ulcer length per rat of 0.85 mm. For Group IV, in which six rats were administered ketorolac solid dispersion of ketorolac-Eudragit RL 100, only two rats show ulcer with ulcer incidence of 33.30%, an average ulcers number per rat of 0.66 mm and an average cumulative ulcer length per rat of 1.16 mm. For Group V, in which six rats were administered ketorolac solid dispersion of ketorolac-Ethyl cellulose, only two rats show ulcer with ulcer incidence of 50.00%, an average ulcers number per rat of 0.93 mm and an average cumulative ulcer length per rat of 1.86 mm. The obtained results indicated that ketorolac solid dispersion system significantly reduced ulcer incidence, number of ulcers per rat and cumulative ulcer length per rat (p<0.05) as compared with the data of ketorolac group which were administered the same dose. For Group VI, six rats administered ketorolac microcapsules of ketorolac-Eudragit RS 100, as control shows zero ulcer incidence as, no one develops ulcer from the total rats of this group (all stomachs are of normal type). For Group VII, in which six rats were administered ketorolac microcapsules of ketorolac-Eudragit RL 100, only one rat shows ulcer with ulcer incidence of 16.66%, an average ulcers number per rat of 0.33 mm and an average cumulative ulcer length per rat of 0.83 mm. For Group VIII, in which six rats were administered ketorolac microcapsules of Ethyl cellulose, two rats show ulcer with ulcer incidence of 33.30%, an average ulcers number per rat of 0.89 mm and an average cumulative ulcer length per rat of 1.32 mm. The obtained results indicated that, encapsulation of ketorolac in a carrier and slow diffusion of the drug into the mucosal media could alleviate the problem of gastric ulceration. Microencapsulation of ketorolac using Eudragit RS100, Eudragit RL100 as well as Ethyl cellulose at drug to polymer ratio of (1:3) significantly reduced gastric irritations and gastric ulcers compared to the free drug (p<0.05). Based on the severity of mucosal damage, each specimen was assigned a score. The scores were averaged and the mean score tabulated as the ulcer index for the drug suspension administered. Six determinations were made for each suspension (on all six rats from each individual treatment group) . Ulcer index of all animal groups is presented in Table 4. The obtained results indicated that ketorolac solid dispersion system significantly reduced ulcer index (p < 0.05) as compared with the data of ketorolac group of the same dose. Group VI (ketorolac microcapsules of ketorolac-Eudragit RS 100) shows ulcer index of zero. Group VII (ketorolac microcapsules of ketorolac-Eudragit RL 100) shows ulcer index of 0.33. Group VIII (ketorolac microcapsules of ketorolac-Ethyl cellulose) shows ulcer index of 0.52. The obtained results indicated that, encapsulating of drug in a carrier and slow diffusion of the drug into the mucosal media could alleviate the problem of gastric ulceration. Microencapsulation of ketorolac significantly reduced gastric irritations and gastric ulcers compared to the free drug (p < 0.05). Macroscopic examination of rat stomachs of the control group administered distilled water as well as rat stomachs which were administered ketorolac, their solid dispersion systems and also there microcapsules were presented in Figure 1. 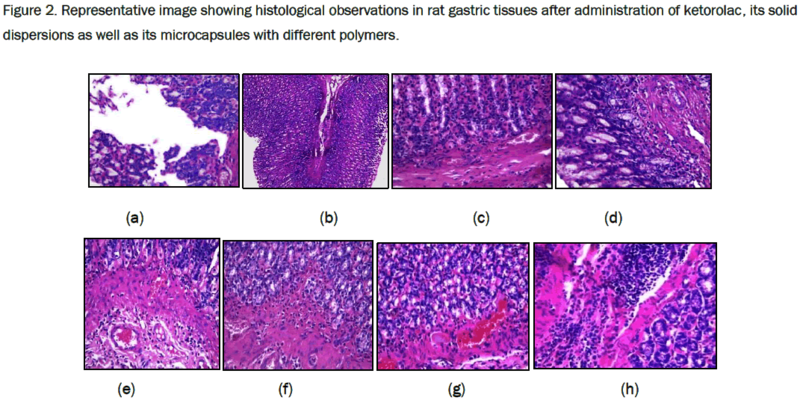 Figure 1: Representative image showing morphological changes in rat gastric tissues after administration of ketorolac, its solid dispersions as well as its microcapsules with different polymers. Gross study of gastric lumina of the control group showed completely an apparent normal gastric mucosa regarding a normal rauga and mucous covering layer (Figure 1a). A rat stomach which administered a dose of (5 mg/kg) of ketorolac, showed pin point hemorrhagic area as well as a wide spread hemorrhaging as indicated by the red spots which are blood clots (Figure 1b). A rat stomach which was administered ketorolac-Eudragit RS100 solid dispersion formula, showed a normal gastric mucosa with a small area of congestion covered by a thick layer of mucosa (Figure 1c). A rat stomach which was administered ketorolac-Eudragit RL100 solid dispersion formula, showed a large area of congestion covered by a thick layer of mucosa (Figure 1d). A rat stomach which was administered ketorolac-Ethyl cellulose solid dispersion formula, showed a wide spread congestion with a small hemorrhagic area covered by a thick layer of mucosa (Figure 1e). A rat stomach which was administered ketorolac-EudragitRS100 microcapsules formula showed no detected ulcer spots on the gastric mucosal surface or any injury to tissue morphology (Figure 1f). A rat stomach which was administered ketorolac-EudragitRL100 microcapsules formula showed a normal gastric mucosa with evoked a focal area of congestion covered by a thick layer of mucus (Figure 1g). A rat stomach which was administered ketorolac-Ethyl cellulose microcapsules formula showed an apparently normal gastric mucosa with a little pin pointed hemorrhagic area covered with mucous (Figure 1h). Effect of ketorolac, its solid dispersion and its microcapsules formula on stomach tissue histopathology is presented in (Figure 2). Figure 2: Representative image showing histological observations in rat gastric tissues after administration of ketorolac, its solid dispersions as well as its microcapsules with different polymers. The histopathological pattern of the mucosal specimens was studied by examining the histology of the treated and control samples. Histopathological examination of Hx & E stained stomach sections of control rats (n=6) administered distilled water, revealed that all the six animals showed completely normal gastric mucosa with excess mucous layer (Figure 2a). In rats (n=6)administered ketorolac (5 mg/kg), histopathological examination revealed that all the six animals showed pronounced necrotic gastric mucosa with severe dilated congested blood vessels in the lamina properia with severe edema infiltrated by inflammatory cells (neutrophil infiltration), also superficial mucosal layer showed marked congestion and necrosis (Figure 2b). In rats (n=6) administered ketorolac-Eudragit RS100 solid dispersion, histopathological examination revealed that stomach tissue of animals showed superficial swollen (edematous) mucosa covered with apparent thick mucosal layer (Figure 2c). In rats (n=6) administered ketorolac-Eudragit RL100 solid dispersion, histopathological examination revealed that stomach tissue of animals showed superficial degenerated (swollen cells) infiltrated with inflamed cells (Figure 2d). In rats (n=6) administered ketorolac-Ethyl cellulose solid dispersion, histopathological examination revealed that stomach tissue of animals showed intact gastric epithelial lining cells and parietal cells analogous to those observed for control fed plain water (Figure 2e). In rats (n=6) administered ketorolac-Eudragit RS100 microcapsules, histopathological examination revealed that stomach tissue of animals showed mild congestion in the lamina properia with minimal widen gastric crypts and excess intercellular mucous secretions (Figure 2f). In rats (n=6) administered ketorolac-Eudragit RL100 microcapsules, histopathological examination revealed that stomach tissue of animals showed mild congestion in the lamina properia with minimal widen gastric crypts and excess intercellular mucous secretions (Figure 2g). In rats (n=6) administered ketorolac-Ethyl cellulose microcapsules, histopathological examination revealed that all the six animals showed superficial focal ulceration with surrounding swallowed degenerated superficial mucosal covering and excess covering mucous layer by inflamed cells (Figure 2h). From the obtained results it is clear that, using ketorolac in a dose of (5 mg/kg) produces the largest gastric damage. The ulcer index, the number of ulcer per rat, cumulative ulcer length per rat and ulcer incidence were larger compared with other groups either solid dispersion or microcapsules (p<0.05). After administration of a single dose of ketorolac-Eudragit RS 100 solid dispersion formula, significant reduction of 83.34% in ulcerogenic activity as compared to free drug of the same dose in regard to the ulcer index of both groups occurred. After administration of a single dose of ketorolac-Eudragit RL 100 solid dispersion formula, significant reduction of 66.70% in ulcerogenic activity as compared to free drug of the same dose in regard to the ulcer index of both groups occurred. After administration of a single dose of ketorolac-Ethyl cellulose solid dispersion formula, significant reduction of 50.00% in ulcerogenic activity as compared to free drug of the same dose in regard to the ulcer index of both groups occurred. In case of administration of a single dose of ketorolac-Eudragit RS 100 microcapsules formula, significant reduction of 100% in ulcerogenic activity as compared to free drug of the same dose in regard to the ulcer index of both groups occurred. In case of administration of a single dose of ketorolac-Eudragit RL 100 microcapsules formula, significant reduction of 83.34% in ulcerogenic activity as compared to free drug of the same dose in regard to the ulcer index of both groups occurred. After administration of a single dose of ketorolac-Ethyl cellulose microcapsules formula, significant reduction of 66.70% in ulcerogenic activity as compared to free drug of the same dose in regard to the ulcer index of both groups occurred. The integrity of the gastric mucosa depends on the balance between aggressive (HCl, pepsine) and protective factors (mucus and HCO3-secretion, prostaglandins, mucosal blood flow, nitric oxide) . The effective treatment depends not only on the blockade of acid secretion, but also on the increased production of factors responsible for protecting the gastric mucosa, thus avoiding damage to the epithelium . Inhibition of prostaglandin synthesis is well recognized as the central mechanism by which gastrointestinal injury occurs . This is a result of inhibition of cyclooxygenase enzyme which converts unsaturated fatty acids (which are released during cell injury) such as arachidonic acid to prostaglandins. In the stomach, prostaglandin synthesis is protective as a result of enhanced mucosal blood flow and stimulation of mucous and bicarbonate secretion . In contrast, in arthritis, prostaglandins mediate pain and some components of inflammation. Recognition of two isoforms of cyclooxygenase, with COX1-predominating in the stomach and an inducible COX-2 expressed at sites of inflammation offer the prospect of separating the beneficial effects of inhibiting prostaglandin synthesis in joints from the harmful effects of inhibiting it in the stomach . The primary objective of the present investigation was to determine whether the enteric-polymers provide protection against ketorolac-induced damage to gastric mucosa. Results showed that the enteric-polymers used in this study are capable of providing protection to the gastric mucosa against ketorolac -induced gastric injury. In most of our experiments, the ketorolac -induced gastric ulceration was maximally protected by coating with enteric-polymers at the dose of 5 mg/kg (fed orally). The histological studies showed that, this is evident from the macroscopic as well as microscopic studies, when enteric-polymers were used at effective ratio (1:3), a complete protection of the tissue morphology with no ulcers was observed, indicating again the effectiveness of these polymers against ketorolac -induced gastric ulceration in rats. The obtained results of solid dispersion systems indicated that solid dispersion systems are able to protect the drug in a good manner to some extent. Encapsulating of ketorolac in a carrier and slow diffusion of the drug into the mucosal media could alleviate the problem of gastric ulceration. Microencapsulation of ketorolac using Eudragit RS100, Eudragit RL100 as well as Ethyl cellulose at drug to polymer ratio of (1:3) significantly reduced gastric irritations and gastric ulcers compared to the free drug. From the obtained results of microcapsules, it is clear that the microencapsulation technique is better than solid dispersion technique in coating efficiency as well as in drug release. Microencapsulation technique has a great role in reducing the ulcerogenic as well as the other gastro-toxic side effects of ketorolac. It is clear that the major contribution of the local ulcerogenic effects of ketorolac can be appreciated from the decreased incidence and magnitude of ulcers following the use of enteric coated formulations. It is possible to overcome the problem of gastric damage during the use of ketorolac, by avoiding the exposure of the drug to the ulcer-prone area of the GI tract. Gøtzsche PC. Methodology and overt and hidden bias in reports of 196 double-blind trials of non-steroidal anti-inflammatory drugs in rheumatoid arthritis. Controlled Clin. Trials. 1989;10:31-56. Wallace JL and Tigley AW. Review article. New insights into prostaglandins and mucosal defence. Aliment Pharmacol Ther. 1995;9:227-235. Davies NM, et al. Aspirin causes rapid up-regulation of cyclooxygenase-2 expression in the stomach of rats. Aliment Pharmacol Ther. 1997;11:1101-1108. Alsarra IA, et al. Proniosomes as a drug carrier for transdermal delivery of ketorolac. Eur. J. Pharm. 2005;59:485-490. Genc L and Jalvand E. Preparation and in vitro evaluation of controlled release hydrophilic matrix tablets of ketorolac tromethamine using factorial design. Drug Deliv. Ind. Pharm. 2008;34:903-910. Gupta AK, et al. ketorolac entrapped in polymeric micelles, preparation, characterization and ocular anti-inflammatory studies. Int. J. Pharmacol. 2000;209:1-14. Yee JP, et al. Comparison of intra-muscular ketorolac tromethamine and morphine sulfate for analgesia of pain after major surgery. Clin. Pharmacol. Ther. 1986;273:253-261. Brown CR, et al. Comparison of ketorolac tromethamine and morphine sulfate in the treatment of post-operative pain. Pharmacotherapy. 1986;10:1165-1251. Goodman E. Use of ketorolac in sickle cell disease and vasoocclusive crisis. Lancet. 1991;338:641-642. Estenne B, et al. Comparison of ketorolac, pentazocine and placebo in treating postoperative pain. Curr. Ther. Ros. 1988;43:1183-1182. O'Hara DA, et al. ketorolac Tromethamine as compared with morphine sulfate for treatment of post-operative pain. Clin. Pharmacol. Ther. 1987;41:555-561. Bhaskaran S and Suresh S. Biodegradable microspheres of ketorolac tromethamine for parenteral administration. J. Microencapsulation. 2004;21:743-750. Grant D Innes, et al. Ketorolac versus acetaminophen -codeine in the emergency department treatment of acute low back pain. 1998;4:549-556. Jyothi Sri, et al. Microencapsulation A review. Int. J. Pharm. And Bio. S. 2012;3:509-531. Poshadri A and Aparna Kuna. Microencapsulation Technology A review. J. Res Angru. 2010;38:86-102. Nitika A, et al. Microencapsulation, A novel Approach in Drug Delivery. A review, Indo Glob. J. Pharm. Sci., 2012;2:1-20. Meshali M, et al. A new approach to encapsulating non-steroidal anti-inflammatory drugs; Bioavailability and gastric ulcerogenic activity Ι. J. of Microencapsulation. 1987;4:133-190. Meshali M, et al. A new approach to encapsulating non-steroidal anti-inflammatory drugs Physicochemical properties ΙΙ. J. of Microencapsulation. 1987;4:141-150. Loftsson T and Brewster M. Pharmaceutical application of cyclodextrins І; Drug Solubilzation and Stabilization. J. Pharm. Sci. 1996;85:1017-1025. Lin SY and Kawashima Y. Drug release from tablets containing cellulose acetate phthalate as an additive or enteric-coating material. J. Pharm. Res.1987;4:70-74. Boh B, et al. Microencapsulation technology applications; with special reference to biotechnology. J. of Microencapsulation. 1996;51-76. Sera juddin A. solid dispersion technique. J. Pharm. Sci. 1999;88:891-900. Rassu G, et al. Ketoprofen spray-dried microspheres based on Eudragit RS and RL; study of the manufacturing parameters. Drug Dev. Ind. Pharm.2008 34:1178 -1187. Sudhamani, et al. Preparation and evaluation of ethyl cellulose microspheres of Ibuprofen for sustained drug delivery. Int. J. Pharm. Res. Dev. 2010;2:119-125. Wong SM, et al. Enhancement of the dissolution rate and oral absorption of a poorly water soluble drug by formation of surfactant-containing microparticles. Int. J. Pharmaceutics. 2006;317:61-68. Esmat Zien El-Deen, et al. Effect of certain polymers on the ulcerogenic activity of a non-steroidal anti-inflammatory drug. World J. Pharm. Res. 2015;4:2275-2290. El-Gizawy SA, et al. Solid Dispersion and Air Suspension Techniques for Obtaining Controlled Drug Delivery System Containing Ketorolac and Paracetamol. World J. Pharm, Sci. 2014;2:765-774. El-shitany NA. Mechanism of omeprazole induced gastric protection against ethanol-induced gastric injury in rats; Role of mucosal nitric oxide and apoptotic cell death. Proceeding of 1st international Egyptian-Jordanian conference on biotechnology and sustainable development: current status& future scenarios, Medical& Pharmaceutical. 2006;2:183-193. Bhargava KP, et al. Mechanism of ulcerogenic activity of indomethacin and oxyphenbutazone. Eur. J. Pharm. 1973;22:95. Schmassmann A, et al. Effect of inhibition of prostaglandin endoperoxide synthase-2 in chronic gastro-intestinal ulcer models in rats. Br. J. Pharmacol. 1998;123:795-804. Brzozowski T, et al. Classic NSAIDs and selective cyclooxygenase (COX-1) and (COX-2) inhibitors in healing of chronic gastric ulcers. Microsc. Res. Tech. 2001;1:343-53. Granados-Soto V, et al. Relationship between pharmacokinetics and the analgesic effect of ketorolac in the rat. J. Pharmacol. Exp. Ther. Jan. 1995;272:352-356. El-Gizawy SA, et al. Formulation, in-vitro and in vivo evaluation of ketorolac tromethamine controlled release drug delivery system. World J. Pharm Sci. 2014;2:793-806. Alsarra IA, et al. Influence of Cyclodextrin Complexation with NSAIDs on NSAIDs/Cold Stress-Induced Gastric Ulceration in Rats. Int. J. Ned. Sci. 2010;7:232-239. Karanachi AA, et al. Comparative Evaluation of the severity of gastric ulceration by solid dispersions and coprecipitates of indomethacin. J. of Drug Targeting. 1997;4:297-301. Lam E, et al. Enhancement of gastric mucosal integrity by Lactobacillus rhamnosus. G.G. Life Sci. 2007;80:2128-2136. Moraes TM, et al. Effects of limonene and essential oil from Citrus aurantium on gastric mucosa, role of prostaglandins and gastric mucus secretion. Chemico-Biological Interactions, 2009;180:499-505. Vane JR. Inhibition of prostaglandin synthesis as a mechanism of action for aspirin-like drugs. Nat New Biol. 1971;231:232-235. Hawkey CJ. Cyclooxygenase inhibition, between the devil and the deep blue sea. Gut. 2002;50:25-30. Fu JY, et al. The induction and suppression of prostaglandin H2 synthase (cyclooxygenase) in human monocytes. J. Biol. Chem. 1990;265:737-740.